Here in the Lehigh Valley, Dr. Salivonchik is using cosmetic dentistry to transform lives by providing personalized smile makeovers, and porcelain veneers lead the list as one of the most popular procedures available today. In just two appointments, they can give you a set of teeth that is bright, beautiful, and completely natural looking. No matter what you want to change about your look, porcelain veneers can deliver truly stunning results. To get started, contact us today. Why Choose S. John Salivonchik, D.M.D., P.C. for Porcelain Veneers? You will need to schedule an hour or two for your initial appointment, and you may want to take photos or magazine clippings to show Dr. Salivonchik the kind of smile you prefer. After a thorough examination to assess your oral health and existing teeth, he will discuss with you the kind of smile you envision. Be prepared to discuss the color and shape of your ideal smile at this appointment. Skilled cosmetic dentist Dr. Salivonchik will take notes on the shade of your teeth, your facial features, and measurements of your face. He’ll consider your skin tone and facial symmetry when designing your veneers. If you have questions about your veneers or the procedure, Dr. Salivonchik will be happy to give comprehensive answers. You may want to ask to see his portfolio or inquire about digital imaging, which is software that manipulates a photo to predict what you will look like after your smile makeover. 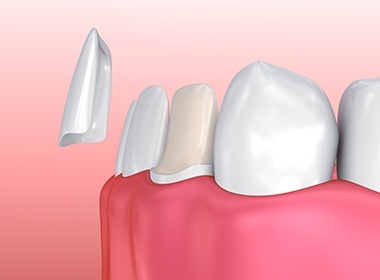 Often during the first appointment, Dr. Salivonchik will gently buff your teeth to remove 1 to 2mm of enamel in preparation for your new veneers. Tooth reduction will allow the veneers to lie flat, in line with surrounding teeth. Reshaping of the teeth may also be required to create the look you want. Dr. Salivonchik will take an impression of your mouth to send to the lab. Before you leave the dental chair, temporary veneers will be placed. We take time to make sure the temporaries look good because we use them as a preview for the final veneers. 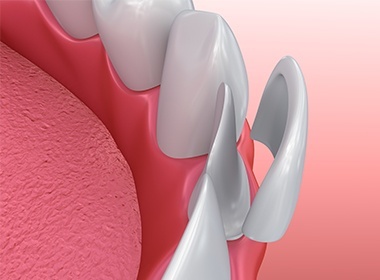 Your teeth may feel sensitive until the permanent veneers are placed. After your first appointment, Dr. Salivonchik will order your veneers from his carefully chosen dental lab. 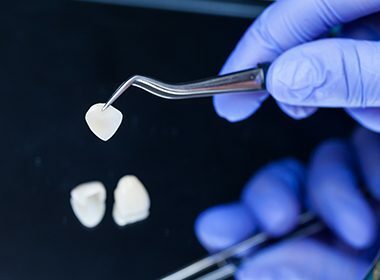 A highly talented ceramist will handcraft the porcelain veneers from durable materials that look and function like natural teeth. 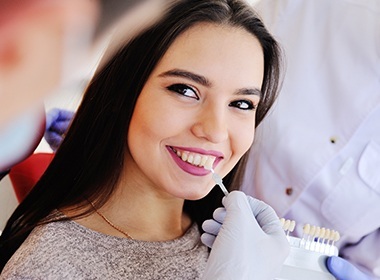 The information that Dr. Salivonchik provides the lab will ensure that you receive veneers that will create a smile that complements your appearance. The lab will ship your veneers to our Allentown dental office. Local anesthetic may be administered to ensure your complete comfort during veneer placement. Dr. Salivonchik will remove the temporary veneers and check the fit of your permanent veneers. You can look at the shape, color, and fit before they are attached. If adjustments need to be made, you should tell us at this time. Veneers cannot be altered once in place. If all is well, Dr. Salivonchik will permanently bond the new veneers to the front surface of your teeth. First, he will apply a mild acidic solution to clean the surface of your teeth, and then he will bond the veneers in place. A small light will cure the bonding material. Dr. Salivonchik will make sure that the veneers allow adequate flossing space.